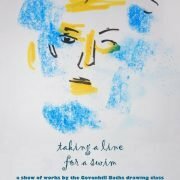 This is the last weekend chance to catch the exhibition Taking a Line for a Swim a show of works by particpants in our recent drawing classes, in the foyer. The exhibition will be open 9.30am-3.30pm on Saturday and will then only be open during office hours until 02 March. Govanhill Theatre present Whisky Galore – a Radio Play in the Rags to Riches Studio at 7.30pm on Friday, Saturday and Sunday. Tickets are £10 (£6 concession) at the door or, in advance from www.brownpapertickets.com. What Is Our Name? is an one-off exhibition by Glasgow School of Art students Hyoney Kim, Lam Shun Hui, Roisin Cairney and Sarah Hilley, in Nessa’s Room 5-7.30pm on Friday 23rd. 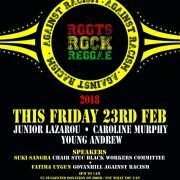 And, Govanhill Baths Community Trust and Ja Live luanch a new initiative called Roots Rock Reggae Against Racism at the Rum Shack tonight (23 Feb) 8pm-1am. RRRAR emerged from the concert in Queens Park last year that featured Aswad, Misty in Roots and Black Roots and aims to use reggae music as a way to build bridges and bring people together. there will be a series of events throughout the year, soundsystem workshops and a major concert at the time of Govanhill International Carnival. The launch event is entry by donation and features DJs Hectorr, Junior Lazarou, Caroline Murphy and Young Andrew, with speakers Suki Sangha (STUC Black Workers Committee) and Fatima Uygun (Govanhill Against Racism). Come along ans how your support and have a dance. Govanhill Baths Community Trust is now looking for an additional swimming teacher to join our small team to support delivery of our Learn to Swim Programme. Classes are small, with 2 teachers per class working in the water to support the learners. 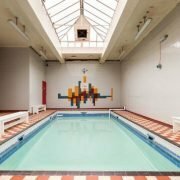 We aim for a fun, learning environment, while our learners build water confidence and begin to master the techniques required for becoming a competent swimmer. We are particularly looking for a teacher to deliver our Monday after-school lessons. If you have a Teaching Swimming qualification and have the enthusiasm to inspire others to learn to swim, please get in touch. Role: Support the delivery of swimming lessons to individuals in class lessons to ensure that they each progress at their own pace. February is another busy month at The Baths, and also sees the launch of a Community Interest Company that has emerged out of last year’s Govanhill International Carnival. Our latest art exhibition in the foyer launches today (February 06). TAKING A LINE FOR A SWIM is a show of work by the participants from our evening drawing class. Its free and will be available to view during opening hours until Friday March 02. ROOTS ROCK REGGAE AGAINST RACISM (RRRAR) is a new CIC launched in the wake of last year’s Govanhill International Carnival. During the Carnival we celebrated the 40th anniversary of the historic Rock Against Racism movement with a concert in Queens Park featuring reggae legends Aswad, Misty in Roots and Black Roots, launched by Jeremy Corbyn. RRRAR is the brainchild of one of the organisers of that event, Jah Live! Their launch takes place at The Rum Shack on Friday 23 February, we hope you can join us at the first of many regular events.